This thread is for all things related to The Firm....because I checked back pretty far, and we don't really have one.....and they deserve it ! I just got done listening to some Firm shows. I was blown away by how tight this band was by 1986. Jimmy's playing is far better than most people give him credit for. Even the fretless Bass now sounds good ! The lame studio songs like "Cadillac" and "You've Lost That Lovin Feelin" seem to come alive on stage. While listening to some of their shows, I couldn't help but think that Rodgers and Page didn't get enough credit at the time for the chances that were taken with this band. The shadow of Zeppelin and even Bad Co. would loom large over anything either tried at this point of their careers, yet this band really didn't attempt to copy either. That in itself was no small accomplishment. With both having a vast back catalog to rely on, Rodgers and Page relied only on the present. The mid-80's were also not the best time for a new veteran hard rock band to get on the map. In fact, the aging dinosaur cracks from the press began before anyone even heard a tune. I remember finding "Mean Business" in the cut-out bin at the local music store for $1.99...about a year after it's release. I already owned it, but it pissed me off so bad that I bought another two copies on vinyl. So maybe you hate the fretless Bass sound....Jimmy's B Bender.....the lack of improv.....but I think The Firm as a whole is wearing quite well these days. Good to know they came off better in concert as their two records really did sound quite polished. I remember searching high and low for this back in the day. I still have that EP. The live stuff is tremendous, and the extended mix of Radioactive is nice and loose. A fun listen. I saw the Firm in concert back in the 80's in Wichita, KS. It was a great concert and I remember how excited I was to see Jimmy! I think it was actually one of the few concerts I went to that I remembered going to it! There were some I don't remember like Foghat and Blue Oyster Cult...too much liquid refreshment and other things on the way to the concert for that one! I was going through one of my clothes closets a couple weekends ago and found some of my concert t-shirts in a box and there was my Firm concert t-shirt! I couldn't remember if I still had it or not. I gave a bunch of my concert t-shirts away years ago and now I kick myself for doing that! Glad I still have the Firm one but it doesn't fit me anymore! I saw the Firm in concert back in the 80's in Wichita, KS. It was a great concert and I remember how excited I was to see Jimmy! performance in the states, having opened the North American leg of their world tour two nights prior at the Reunion Arena in Dallas. is titled "Firm's Resume is Impressive". I'm still seeking a copy should anyone have it. Yes, 1985 at the Civic Center! I was thinking it was one of their very first concerts in the States. I think I bought a concert program too and have it packed away somewhere with all my concert stubs. I need to find that box as I know I have it somwhere from moving from Kansas to North Carolina to Illinois. I didn't know an article was in the Wichita paper right before the concert date. I hate to say it, but I was more of a Paul Rodgers fan back in the day than a Jimmy fan. Now I guess I would consider myself one of the Pagettes. ...Welcome, there is always room for Pagettes. I love the Firm too. I don't mind Paul Rodgers, however, Freddie Mercury remains my fav. Christine McVie could play keyboards. And of course we need Jonesy on bass. I love Carlos, too. It would be fantastic to see him jam with Jimmy. Did you see Carlos jamming with Eric Clapton during one of Eric's Crossroads concerts? It was fantastic. They played Jingo. And people, we are not being serious about this, by the way. I have this show TiVo'd and I cannot just play that song once. I have to play it ten times, I love it so much. I am going to see Eric Clapton with Steve Winwood on June 15th at the Shottenstein Arena in Columbus with my entire family. Seeing this video just got me excited about it. June 23rd in Dallas for me. Hope you have a great time, Aqua. I will try to post a review after the show. I will! I'm sure you will too--we'll compare reviews. Plus I know others are going too, at different times. I have a live boot from Cleveland 1986 that says otherwise. A very energetic performance! I have that too! I was after City Sirens. Seems to me that's from the same show they broadcast in 1984 on WBCN Boston before the first LP came out. Hammersmith Odeon. I didn't notice Cadillac until I saw a 1986 tour vid and they tore it up. Now that's my favorite Firm song. IMHO this is the closest they sound to headiness of Zeppelin. I have a few "shows" from The Firm in my collection. The best for sound quality and performance (from what I've heard so far) is Cleveland 1986. It doesn't get much better than that. It's good enough by far to be an official release. Sources from the studio we recorded at (with my project) told me a few stories of Page (from meeting him at Sound Check Music, in Metairie, LA which is where Page's ex-wife is from) back in the 80's with The Firm and his Outrider tour in 88'. I've heard (don't know how exact the statement is) that Page wasn't fond of touring with Rogers that much...He said "it was like touring with his grandmother". I guess they didn't pursue the same off stage activities together? I can believe that, considering Page's known habits and more so girl I dated for a long time (she was a few years older than me) told me a story once that had me baffled/jealous. She knew what a Zeppelin freak I was. In 1985 she was living in Metairie, LA ( I must express that she was a rock n roll chick and very attractive) she knew alot of people and some where connected to famous individuals, as the story reveals. She claims that she was sleeping one night (very late/early A.M.) and her friend Michael was knocking on her window (she was living with a roomate) He was a local druggy/limo driver/something or other, with connections? She opened up the window and the guy (Michael) crawled in, along with his "friend" Jimmy. They sat in the dark and talked for a while. Michael's friend Jimmy never said much that made sense (he just mummbled various things and was apparently wacked out of his mind) nothing much went on besides some conversation, from what she said. The next day her friend (Michael) stopped by and asked if she realized who that "friend" of his was. She said no. He told her it was Jimmy Page! She was in total disbelief to say the least. Apprently he wanted Jimmy to meet her. But from what she remembers he just mummbled things and sat in a corner of the room on the floor. She didn't recoginze him because no lights were turned on. Also, the guy (Michael) didn't make a big deal about who he was at the time, or mention his last name. She said the guy was hired (by whom, I don't know) to take Jimmy around town after the show and score some drugs for him/ show him a good time. Michael was also Bi-sexual from what she told me. Which may mean nothing to the story. 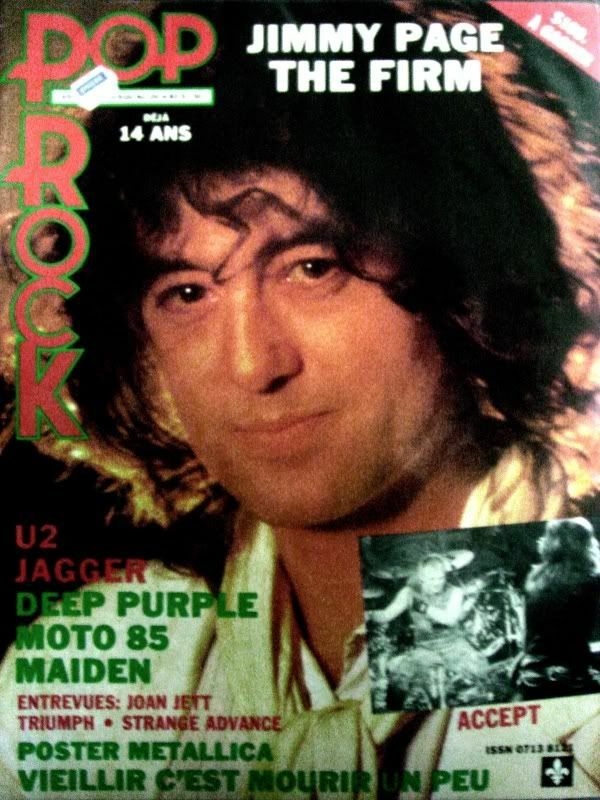 Nevertheless, theres my Jimmy Page story of the day, told to me first hand from a reliable source. It was hard for me to believe at first but it sounds convincing and he did have ties to Metairie back in the 80's which makes it very possible. to Mother's attending with their children (I'm not kidding!). 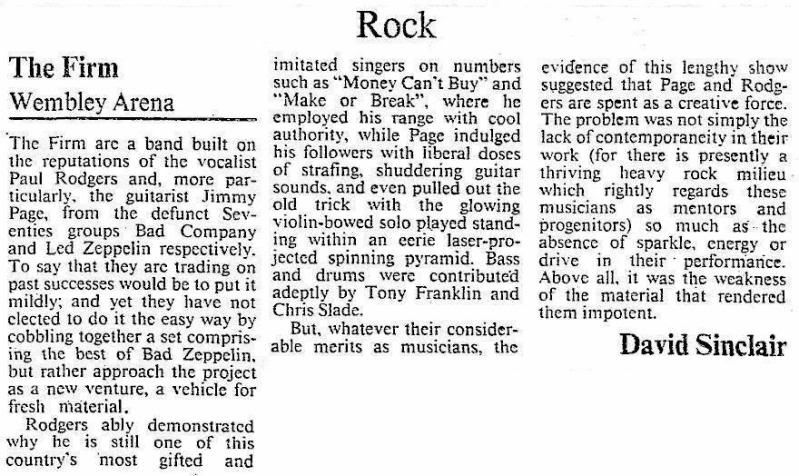 Nevertheless, theres my Jimmy Page story of the day, told to me first hand from a reliable source. No offence my friend, but it's " stories " like this that get told and then retold and on and on until they get believed by some. Interesting to read, somewhat , whatever turns your crank. As I said, no harm meant here, but this sounds about as real as that other tale told here about JP playing an acoustic guitar on some beach in Florida , riffing off all of Zepp 1 songs and apparently going incognito. Another 4 AM nightly fairy tale. I can't sit here and say it didn't happen and won't argue the point, but felt compelled to say something about issues like this. Jimmy Page crawling through windows in the middle of the night , mumbling and not being recognized , hmmmmmmmmm. I think I will laugh now. he met Patricia Ecker (a waitress) around this time too.